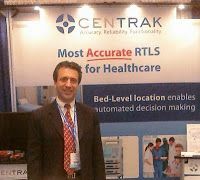 Dr. Ari Naim, CEO and Co-Founder of CenTrak spoke about the future path for Real-Time Location System adoption in the healthcare marketplace. There was standing room only when Dr. Naim spoke at the Department of Veterans Affairs VHA Real Time Location Systems event in Atlanta, GA on June 2. He presented the key principles of an ideal Real Time Location System installation – high performance, 100% room and bay-level accuracy, reliable, scalable, and easy to install and integrate with existing systems. The high-level of accuracy and scalability enables the RTLS to be used as a reliable data source for many future clinical applications. The potential applications or use cases go well beyond asset tracking – including patient tracking and staff locating. A well-planned Real-Time Location System can actually serve as a key data hub to inform and optimize many hospital processes.